The Dragalevtsi monastery, named “Virgin Mary of Vitosha”, is located about 3 km kilometers south of the village of Dragalevtsi (which became formally a quarter of Sofia a few years ago), up in the lower parts of the Vitosha mountain. 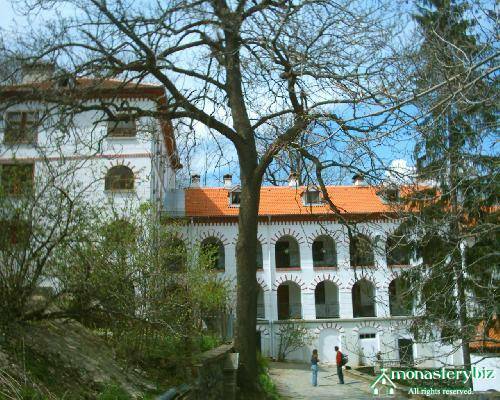 One of the most beautiful monasteries, it could be a perfect stop during a weekend trip in the mountain. The monastery’s establishment dates back to 1345, the time of the Second Bulgarian State (which ended with the Ottoman invasion in Bulgarian lands at the end of the 14th century) and the reign of the Bulgarian King Ivan Alexander (1331-1371). In contrast to most other Bulgarian monasteries, Virgin Mary of Vitosha was saved from destruction by the Ottoman conquerors. Nevertheless, a few years later, it was abandoned by its monks. Soon afterwards, in 1476, it was renovated and brought back to life by a Sofia boyar, Radoslav Mavar. During this reconstruction, the small church of the monastery was decorated with beautiful frescoes, most of which have been preserved to present days. Among these, the portraits of Radoslav Mavar, his wife and two sons carry the highest ethnographic and artistic value. In the 17th century, the central part of the church was decorated with new wall paintings. In 1932, the church was expanded with the attachment of a new building to it - currently, the two parts represent an integral whole with the one sign of their distant époques being the different architectural styles.